Are you tired of having to deal with a tangled mess of cords every time you want to get to your earphones or charger? The longer you use it, the color is more beautiful, and the hand- feel is more softer. QEES is committed to 100% Satisfaction and 90 Days Guarantee for our Customers. So any problem, Feel Free to contact us for Refund or Replacement. No Questions Asked! Our Friendly Service - 24 hours email customer service response. 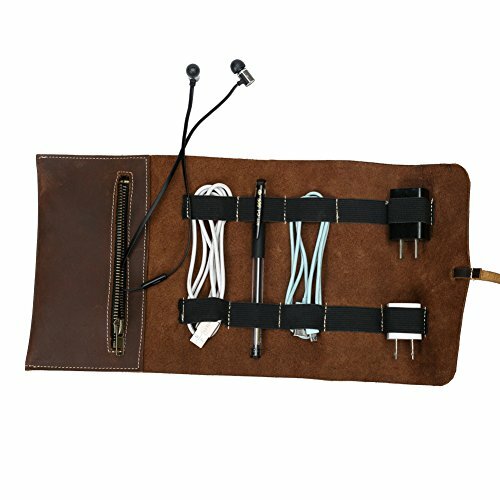 GUARANTEED SATISFACTION:If you are not 100% happy with QEES Genuine Leather Accessory Pouch, Feel Free to contact us for Refund or Replacement. No Questions Asked! If you have any questions about this product by QEES, contact us by completing and submitting the form below. If you are looking for a specif part number, please include it with your message.